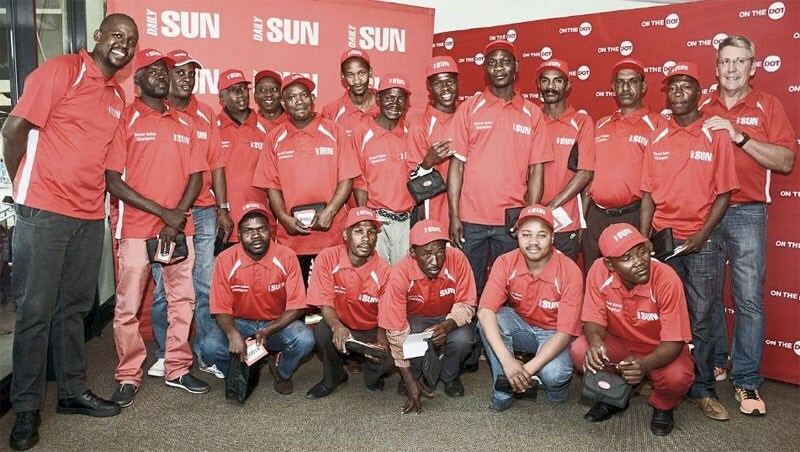 On the Dot, South Africa’s largest multi-channel media logistics company, and the Daily Sun, the country’s biggest daily newspaper, recently hosted the SunSellers competition to reward top newspaper sellers. The competition set out to identify the top 20 Daily Sun street sellers who sold the most newspapers over two months. Champion street sellers with Reggie Moalusi (Daily Sun) and Andre Van Tonder (On the Dot). On the Dot top 20 street sellers are: Lukhanyo, Nonkotamo, Ernest Moehi, Charles Klip, Chicco Mondlane, Nelson Naice, Simon Taaibosch, Nathan Amstredam, Eric Dlamini, Tshepo Mahlophe, Leonard Rametsi, Josta Modlane, Peter Makgoda, Solly Mogare, Kabelo Mosikari, Maqele, Magogo, Dickson Fumu. (Please note that list of names is not according to the picture above, three sellers were unable to attend). The winners were treated to breakfast at On the Dotâ€™s Ormonde offices, followed by a VIP soccer experience at Orlando Stadium in Soweto, where they watched the clash between Orlando Pirates and Mamelodi Sundowns from a private suite. Sellers residing in other cities were flown to Johannesburg â€“ some of them experiencing their very first flight. 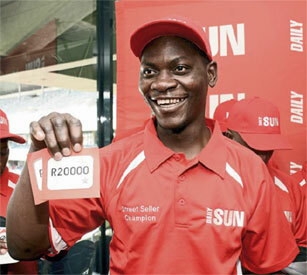 Dickson Fumu won the R20,000.00 lucky draw. Another surprise was a lucky draw where the winners each walked away with prize money ranging from R500 to R20,000. Dickson Fumu from Vosloorus was the recipient of R20,000. Dickson adds that he will continue to sell newspapers every Sunday to Friday morning at his street corner in Boksburg town knowing that On the Dot has acknowledged his good work.